Following my advice in Dual-Boot with Windows 7, Dale Bevan set up a dual boot with Windows 7. He now wants to remove the new OS and stick with the old one. I've already explained how to remove the old version of Windows, but Dale wants to keep that and remove the new one. I really, really hope that this is the last piece I have to write on this subject. I'm getting sick of it. Fortunately, removing Windows 7 is a lot easier than removing Windows XP or Vista and keeping the latest version. 1) I'm assuming that you created the dual-boot following my directions from the first of these posts. Or, if you didn't follow my directions, you did something similar. If you used a third-party multi-boot program, you'll have to look to that program's instructions for removing it. 2) If you've only used Windows 7 long enough to learn that you don't like it (or that it has technical problems on your PC), you probably don't have any important files (documents, email, music, and so on) on the new, Windows 7 partition. If you do, you must move these files to the old partition. See Remove a Windows 7 Dual Boot, Part I for instructions on doing this. But don't follow these instructions to the letter. You have to move your important files off of the Windows 7 partition, not onto it as I described there. 3) I tested this tip with only one partitioning program: EASEUS Partition Master. I can't guarantee it will work with another one. If your old OS is the 32-bit version of Windows XP or Vista, you can use the free Home Edition of EASEUS. But if you're using an x64 version of Windows, you'll have to shell out $40 (on sale for $32 as I write this) for the Professional version. 4) Once again, I recommend (no, I insist) that you make an image backup of your hard drive, including both partitions, before you do anything else. Why? Because fiddling with partitions is inherently dangerous. If you don't already have an image backup program, try the free version of Macrium Reflect. Whatever program you use, you'll need an external hard drive large enough to hold the contents of both partitions. Backed up? Okay. Let's get on with it. Boot into Windows 7. Once there, select Start, right-click Computer, and select Properties. Click the Advanced system settings link in the left pane. On the Advanced tab, under "Startup and Recovery," click the Settings button. Set the "Default operating system" to your old and preferred operating system--in other words, to the option other than Windows 7. 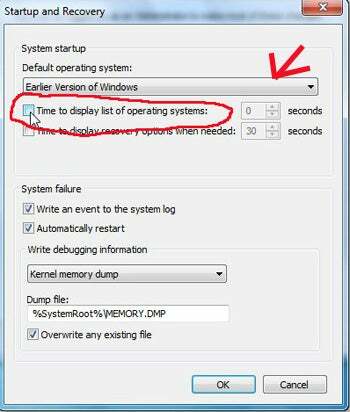 Then uncheck Time to display list of operating systems. Click OK twice, then reboot. You should go directly to your old, preferred Windows version. In XP or Vista, install and then launch EASEUS Partition Master. Right-click the Windows 7 partition and select Delete. Confirm your request with OK.
dialog box, making it as large as available space will allow. Click OK when done. Close the program, and click Yes when asked to confirm your actions. Within a few minutes, you'll have what you started with: a one-boot PC with your old, preferred Windows version. Actually, you'll have more than you started with. You'll also have the knowledge that Windows 7 isn't for you--at least not on this particular PC.